Pilgrimage of peace at Imjingak close to the border between South and North Korea. Pilgrims attach prayers for peace on the iron fence. This year marks the 60th anniversary of the division between the Democratic People’s Republic of Korea (North Korea) and the Republic of Korea (South Korea). The Demilitarized Zone (DMZ) has separated North and South Korea since the military armistice agreement was signed on 27 July 1953 at the close of the Korean War. Since then there have been many efforts to promote the peace and reunification of Korea. 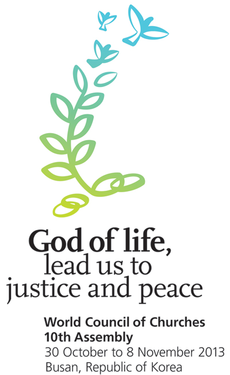 On Saturday 2 November, more than 800 participants in the World Council of Churches (WCC) 10th Assembly joined in a pilgrimage of peace to Seoul, expressing solidarity with the people of Korea and endorsing the worldwide call for the unification of Korea. The pilgrimage of peace began by bus with participants travelling from Busan to Ulsan and then onwards by train to Haengsin. From Haengsin, participants continued the pilgrimage to Mount Dora and Imjingak. Participants gathered at the Bell of Peace erected at Imjingak in supplication for the future unification of Korea. The bell was rung by seven participants representing all the regions of the world, to call for peace in Korea and the world. Imjingak is located 7 km from the military demarcation line. The Bell of Peace was dedicated in 1972 with the hope that someday unification would be possible. WCC assembly participants then crossed the Bridge of Freedom at Imjingak in a stage of the pilgrimage to see and sense the reality of Korea’s division. In the past prisoners of war would cross the bridge to return home. Following the armistice agreement the bridge was put out of use and blocked. The blocked bridge is a visible reminder of the divided Korean peninsula steeped in decades of pain and sadness. At the bridge a train was exhibited which once was used to carry refugees fleeing the war. The train is also no longer in use and is a symbol of the desire of the Korean people to make the railways between north and south run again when peaceful reunification is achieved. The pilgrimage moved to the pond at Imjingak, where participants gathered at the spot under the bridge which is the front line of the division. The spot integrates the past, present and future. Young theology students from the Sungkonghoe University performed a traditional dance for the bride, accompanied by the song Arirang alone. This is a Korean folk song, considered by some to be the most representative of Korean culture, and expresses hope for the reconciliation of Korea. At the bridge, the pilgrims shared messages of peace. Singing together, they offered a hymn called “Now go in peace” as they placed ribbons of peace with a message and prayer for peace on the iron fence along the military demarcation line, adding to the thousands of ribbons and prayers already on the fence. 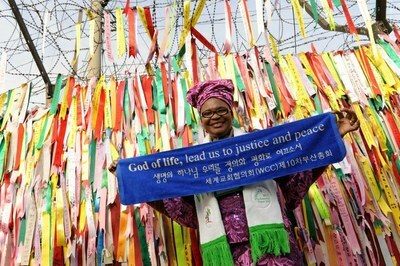 The pilgrimage of peace adds to the Peace Train initiative for peace of the National Council of Churches in Korea and the Korean Host Committee for the WCC assembly, the aim of which is to raise awareness of the continuing division and to campaign for Korea’s reunification. WCC general secretary Rev. Dr Olav Fykse Tveit has called for an end to increased tension on the Korean peninsula. "The fact that the assembly is being held in Korea is from our perspective an expression of the hope of the worldwide church and churches in Korea for pursuing peace and reconciliation," Tveit said. "Peace on the Korean peninsula is possible without hostilities."